Sky Mountain Golf Course is as scenic as it is challenging. Don’t be fooled by the yardage … you’ll earn every stroke here. But when you shave one or two off, it’s all the more satisfying. The course is appropriately named for the amazing views from the elevated tee boxes. Don’t be surprised if you find yourself gazing off at the cliffs of Zion National Park and the azure rim of the Pine Valley Mountains in the distance. Anywhere you look and anytime you play, it’s simply gorgeous! 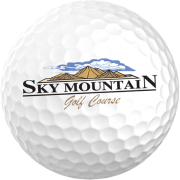 Sky Mountain Golf Course in Hurricane Utah is one of the best values in the area. The golf course is very unique with its rolling fairways and tabletop greens framed by red sand and lava-filled desert surrounds. The incredible panoramic view from the many elevated tees makes focusing on the shot at hand challenging. This is especially true on the 1st, 5th, 17th, and 18th holes as you marvel at the striking beauty of the twisted red rock landscape that gives Sky Mountain its name. This golf course is always in wonderful condition and is a great reward for those willing to leave the beaten path. You’ll need all the clubs in your bag, but most importantly, don’t forget to bring your camera.